Surf-Inspired and ready to ride the concrete wave, the Globe Pin City Cruiser complete has you covered when waves stop breaking. 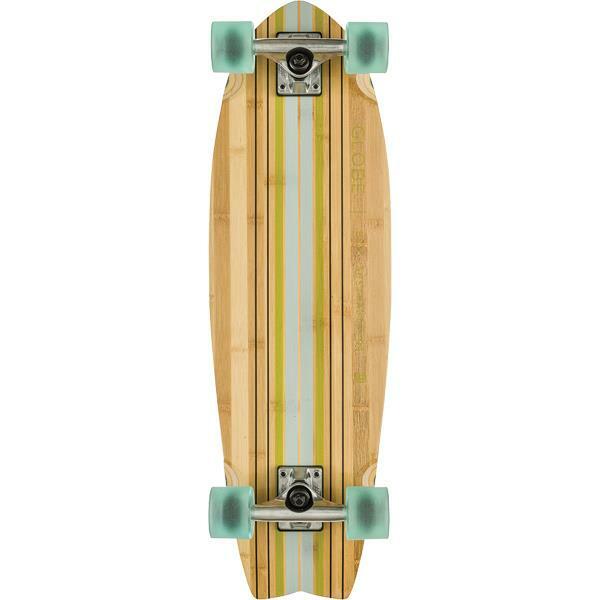 This cruiser has a bamboo construction allowing you to really feel that sidewalk carve. The addition of a kicktail opens up possibilities with the ability to ollie over curbs so you never need to get off. The Pin City comes complete with five and quarter inch regular trucks, 62mm 83a wheels, and ABEC 7 bearings that will keep you rolling for longer. Experience the ultimate in skurfing with the Globe Pin City Bamboo Cruiser complete. what kind of bearings does it have and what color wheels does it come with? It comes with ABEC 7 BEARINGS, it does not come with a extra set, if thats what you're asking. The color wheels that it comes with are the ones seen in the picture. Is there grip tape ?? BEST ANSWER: As the Globe Pin City Cruiser's description reads, yes, there is Clear Broadcast Grip.